1 x Dell MD1000 Chassis. 2 x Power Supplies (Dual Config). 2 x AMP01 Controllers (Dual Config). 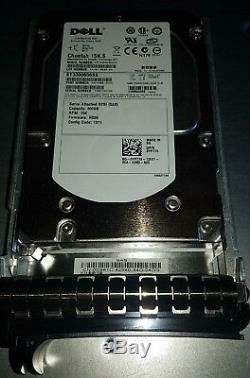 15 x 300GB 15k SAS HDDs. No Rails or power cables. The item "DELL PowerVault MD1000 STORAGE Array with(15x) 300GB 15k SAS HDD Dual Controller" is in sale since Thursday, August 9, 2018. This item is in the category "Computers/Tablets & Networking\Enterprise Networking, Servers\Network Storage Disk Arrays\Other Network Disk Arrays". The seller is "varazslono" and is located in Louisville, Colorado. This item can be shipped to United States.